Received June 28, 2018; Accepted September 13, 2018.; Published online November 6, 2018. IκB, a cytoplasmic inhibitor of nuclear factor-κB (NF-κB), is reportedly degraded via the proteasome. However, we recently found that long-term incubation with proteasome inhibitors (PIs) such as PS-341 or MG132 induces IκBα degradation via an alternative pathway, lysosome, which results in NF-κB activation and confers resistance to PI-induced lung cancer cell death. To enhance the anti-cancer efficacy of PIs, elucidation of the regulatory mechanism of PI-induced IκBα degradation is necessary. Here, we demonstrated that PI upregulates nuclear factor (erythroid-derived 2)-like 2 (Nrf2) via both de novo protein synthesis and Kelch-like ECH-associated protein 1 (KEAP1) degradation, which is responsible for IκBα degradation via macroautophagy activation. PIs increased the protein level of light chain 3B (LC3B, macroautophagy marker), but not lysosome-associated membrane protein 2a (Lamp2a, the receptor for chaperone-mediated autophagy) in NCI-H157 and A549 lung cancer cells. Pretreatment with macroautophagy inhibitor or knock-down of LC3B blocked PI-induced IκBα degradation. PIs up-regulated Nrf2 by increasing its transcription and mediating degradation of KEAP1 (cytoplasmic inhibitor of Nrf2). Overexpression of dominant-negative Nrf2, which lacks an N-terminal transactivating domain, or knock-down of Nrf2 suppressed PI-induced LC3B protein expression and subsequent IκBα degradation. Thus, blocking of the Nrf2 pathway enhanced PI-induced cell death. These findings suggest that Nrf2-driven induction of LC3B plays an essential role in PI-induced activation of the IκB/NF-κB pathway, which attenuates the anti-tumor efficacy of PIs. As the first proteasome inhibitor (PI) approved by the FDA, PS-341, or bortezomib, is well-known for its anti-neoplastic effects toward multiple myeloma and its chemo-sensitizing, synergistic role with other chemotherapeutic agents in controlling myeloma (Richardson et al., 2003). Recently studies have suggested a therapeutic role of PIs in advanced non-small cell lung cancer (NSCLC). (Aghajanian et al., 2002; Fanucchi et al., 2006; Ling et al., 2003; Yang et al., 2004). To improve the poor survival rate and short median overall survival of 8–10 months (Mandrekar et al., 2006), new treatments that can be integrated into the first-line therapy in advanced NSCLC are needed. Nevertheless, PS-341 has shown limited benefits when used as a single agent in NSCLC (Besse et al., 2012). The proteasome is a multicatalytic protease complex that rapidly degrades proteins via the ubiquitin and ATP pathway, but typically not through the lysosome pathway (Coux et al., 1996; Goldberg et al., 1995). Various proteins, such as cyclin, cyclin-dependent kinase inhibitor, p53, NF-κB precursor protein, and IκB are degraded via the proteasome (Maki et al., 1996; Pagano et al., 1995; Palombella et al., 1994). This ubiquitin-proteasome pathway plays an important role in cell cycle regulation and signaling; blocking this pathway causes accumulation of pro-apoptotic proteins, which results in apoptosis of cancer cells but not of normal cells (Masdehors et al., 1999; Soligo et al., 2001). In our previous study, we found that long-term incubation with PIs, PS-341 or MG-132, induced IκBα degradation via an alternative lysosome pathway and resulted in NF-κB activation, which conferred resistance to PI-mediated apoptosis in lung cancer cells (Lee et al., 2013). To maximize the anticancer effect of PI in NSCLC, it is crucial to elucidate the mechanism of resistance to PI-induced apoptosis. In this present study, we investigated which type of autophagy contributes to such resistance to PI in lung cancer cells. Our results showed that PIs up-regulated Nrf2 via both de novo protein synthesis and KEAP1 degradation, resulting in induction of LC3B, a macroautophagy marker, to degrade IκBα and regulate PI-induced cell death. These findings suggest that the activation of macroautophagy via an Nrf2-dependent mechanism suppresses PI-induced lung cancer cell death by IκBα degradation. Rabbit polyclonal anti-IκBα, anti-LC3B, anti-phospho-mTOR (Ser2448), anti-sirtuin1, and anti-KEAP1 antibodies, cycloheximide, p65 siRNAs, and LC3B siRNAs were purchased from Cell Signaling Technology (Danvers, USA). Rabbit polyclonal anti-p65, anti-cIAP2, anti-PARP, anti-Nrf2(C-20), anti-Lamin A/C, goat polyclonal anti-COX-2, anti-GAPDH, mouse monoclonal Lamp2 antibodies, secondary antibodies conjugated to horseradish peroxidase, Nrf2 siRNAs, control siRNAs, Lamp2 shRNAs, and control shRNAs were obtained from Santa Cruz Biotechnology (Santa Cruz, USA). Rabbit polyclonal Lamp2a antibody was from Abcam (Cambridge, UK). TNF-α was from R&D Systems (Minneapolis, USA). Bortezomib (PS-341) was obtained from Selleckchem (Houston, USA) and MG132 was from Calbiochem (Darmstadt, Germany). The eutomer of dehydroxymethylepoxyquinomicin (DHMEQ), (−)-DHMEQ, was from ChemScene (Monmouth Junction, USA). Lipofectamine 2000 was purchased from Invitrogen (Carlsbad, USA). 3-MA and thiazolyl blue tetrazolium blue (MTT) was from Sigma-Aldrich, Inc. (St. Louis, USA). NCI-H157 (ATCC, USA), derived from squamous cell lung cancer, and A549, lung adenocarcinoma epithelial cells, (Korean Cell Line Bank, Korea) were maintained in RPMI (GIBCO by Life Technologies, Grand Island, USA) containing 10% heat-inactivated FBS and 1% penicillin-streptomycin at 37°C under 5% CO2. Experiments performed on cells that were passaged less than 20 times. Total RNA from NCI-H157 and A549 cells was isolated using the RNeasy kit (Qiagen, Germany). cDNA was synthesized from 1 μg of total RNA using a Reverse Transcription system (Promega, USA). PCR amplification was performed with 2× TaqMan gene expression master mix (Applied Biosystems, USA). Nrf2 probe (Hs00975961_g1) and GAPDH probe (Hs99999905_m1) were obtained from Applied Biosystems. Power SYBR Green (Applied Biosystems) was used for PCR amplification for COX-2 and LC3B. COX-2 primers (fwd 5′-TGAGCATCTACGGTTTGCTG-3′, rev 5′-TGCTTGTCTGGAACA ACTGC-3′), LC3B primers (fwd 5′-GAGAAGCAGCTTCCTG TTCTGG-3′, rev 5′-GTGTCCGTTCACCAACAGGAAG-3′) and GAPDH primers (fwd 5′-GAAGGTGAAGGTCGGAGTC-3′, rev 5′-GAAGATGGTGATGGGATTTC-3′) were used. Cells were allowed to equilibrate in ice-cold cytoplasmic extraction buffer (CEB) consisting of 10 mM Tris-HCl (pH 7.8), 10 mM KCl, 1.5 mM EDTA, and 0.5 mM DTT for 5 min. The cells were lysed on ice in a 0.4% NP-40/CEB/protease inhibitor cocktail (Roche Diagnostics Corporation, USA). Following centrifugation at 3,500 rpm for 5 min, the supernatants (cytoplasmic extracts) were collected. The nuclear pellets were washed with CEB and then suspended in nuclear extraction buffer (NEB) consisting of 20 mM Tris-HCl (pH 7.8), 150 mM NaCl, 50 mM KCl, 1.5 mM EDTA, 5 mM DTT, and 0.4% NP-40/protease inhibitor cocktail. Following centrifugation at 13,000 rpm for 15 min, the supernatants (nuclear extracts) were collected. Total cellular extracts were prepared in 1× cell lysis buffer (Cell Signaling Technology). Protein concentrations were determined using the Bradford method (Bio-Rad, USA). Equal amounts of protein were resolved by 4–12% SDS-PAGE (Invitrogen) and transferred to nitrocellulose membranes (GE Healthcare Bio-sciences, UK). The membranes were blocked with 5% skim milk-blocking buffer for 1 h before incubation overnight at 4°C with primary antibodies. The membranes were then washed three times and incubated with horseradish peroxidase-conjugated secondary antibodies in blocking buffer for 1 h. After successive washes, the membranes were developed using SuperSignal West Pico Chemiluminescent kit (Thermo Fisher Scientific, USA). Transfection of control siRNAs, p65 siRNAs, LC3B siRNAs, Nrf2 siRNAs, control shRNAs, or Lamp2 shRNAs was carried out using Lipofectamine 2000 according to the manufacturer’s specifications. After 48 h, the cells were used in experiments. Cells were plated in a 60-mm tissue culture plate. After overnight incubation, the cells were transduced at multiplicities of infection of 50 with adenovirus vectors expressing wild-type Nrf2 (Ad-WT-Nrf2) or dominant-negative Nrf2 (Ad-DN-Nrf2), which lacks an N-terminal transactivating domain, in complete RPMI media for 2 h with gentle shaking and then incubated at 37°C, 5% CO2. After 48 h, the cells were used in experiments. Cell viability was measured by the MTT assay. MTT solution was added to cells (final concentration of 0.5 mg/mL), and the cells were incubated at 37°C for 30 min. After removing the culture media, 50 μL DMSO was added and the optical density of each well was read at 570 nm. Data were evaluated using the Student t-test to determine statistical significance, and a P value of < 0.05 was considered to indicate significance. As described in our previous report (Lee et al., 2013), long-term incubation with PI resulted in IκBα degradation (Fig. 1A) in both NCI-H157 and A549 cells. Expression of NF-κB subunit p65 was increased in the nuclear extracts, indicating the nuclear translocation of NF-κB (Fig. 1B). NF-κB in the nucleus up-regulated NF-κB-regulated gene and protein expression of COX-2 and cIAP2 (Figs. 1C and 1D). The PI-induced increase in COX-2 expression was suppressed by blocking NF-κB activation by two different methods: DHMEQ, which blocks the nuclear translocation and DNA-binding of NF-κB (Fig. 1E), or siRNAs, which were used to knock-down of NF-κB-p65 (Fig. 1F). These results suggest that PI activates the IκB/NF-κB pathway. We previously showed that the activation of lysosomal proteolytic enzymes, also known as autophagy, is involved in PI-induced IκBα degradation (Lee et al., 2013). To determine the subtypes of autophagy involved in this process, we evaluated the effect of PIs on macroautophagy or chaperone-mediated autophagy, which was assessed by measuring its surrogate markers, LC3B and Lamp2a, respectively. 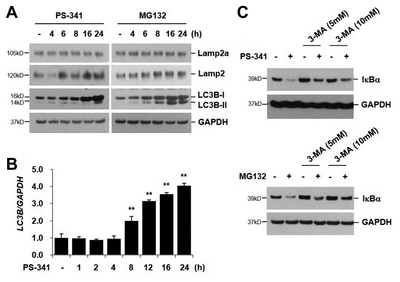 PI increased LC3B, but not Lamp2a, via transcriptional activation (Figs. 2A and 2B). When macroautophagy was blocked by the inhibitor, 3-methyladenine (3-MA), PI-induced IκBα degradation was reduced (Fig. 2C), suggesting an association between PI-induced IκBα degradation and macroautophagy. To elucidate the cause and effect relationship between PI-induced degradation of IκBα and autophagy, we assessed the effect of LC3B or Lamp2a knock-down on PI-induced IκBα degradation. 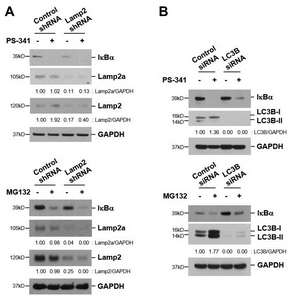 Knock-down of the LC3B gene, but not Lamp2a, reduced PI-induced IκBα degradation (Figs. 3A and 3B). These findings confirm that PI-induced IκBα degradation is dependent on macroautophagy. To further understand the molecular mechanism underlying PI-induced, macroautophagy-dependent IκBα degradation, we searched for upstream regulators of LC3B, such as the mammalian target of rapamycin (mTOR), sirtuin1, and Nrf2 (Esclatine et al., 2009; Zhou et al., 2015; Zhu et al., 2013). mTOR is a Ser/Thr protein kinase and catalytic subunit of two structurally distinct complexes: TOR complex 1 (TORC1) and TORC2. Specially, TORC1 is known to be an upstream negative regulator of Atg1 complex involved in autophagy induction. Inhibition of mTOR activity triggers autophagy (Esclatine et al., 2009). Sirtuin1 is one of the class III histone deacetylases, involving many critical cellular processes including tumorigenesis and cell proliferation. Sirtuin1 induction was reported to abolish autophagy, whereas downregulation of sirtuin1 and inhibition of sirtuin1 activity enhance autophagy in cancer cells (Zhou et al., 2015). However, in this study, PIs did not affect the level of phospho-mTOR and sirtuin1 (Fig. 4A). The activation of Nrf2 has been demonstrated to play a crucial role in cancer cell resistance to different anticancer therapies. PS-341 treatment activates Nrf2 in cancer cells and Nrf2 negatively regulates autophagy in lung epithelial cells (Zhu et al., 2013). PI treatment resulted in up-regulation of Nrf2 and reduced the expression of KEAP1 (Fig. 4A). The down-regulation of KEAP1 has been shown to stabilize Nrf2 and increase its expression; however, de novo protein synthesis by transcriptional activation was also responsible for PI-induced Nrf2 up-regulation (Figs. 4B and 4C). Knock-down of Nrf2 by transfection of siRNAs targeting Nrf2 gene or overexpression of dominant negative-Nrf2 (Ad-DN-Nrf2) repressed PI-induced LC3B induction and subsequent IκBα degradation (Figs. 4D and 4E). However, LC3B transcripts increased rather than decreased in Nrf2 siRNA transfected cells (data not shown). Thus, Nrf2 mediates up-regulation of LC3B protein and subsequent IκBα degradation in PI stimulated cells. We previously reported that NF-κB activation makes lung cancer cells resistant to TNF-α-induced apoptosis (Kim et al., 2000), thus, we assessed whether Nrf2 activation suppresses PI-induced apoptosis. Knock-down of Nrf2 with siRNAs increased cleavage products of poly (ADP-ribose) polymerase (PARP), indicative of the apoptotic cell fraction, in PS-341 treated cells (Fig. 5A). The MTT assay also showed decreased cell viability in DN-Nrf2-overexpressing PI-treated cells (Fig. 5B). A schematic of our hypothesis based on the results of this study is shown in Fig. 5C. Taken together, PI-induced Nrf2 activation results in IκBα degradation via macroautophagy, and subsequent NF-κB activation suppresses apoptotic cell death. In the present study, we showed that Nrf2 up-regulation and subsequent macroautophagy activation are responsible for PI-induced IκBα degradation. We previously demonstrated that IκBα degradation and NF-κB activation confer resistance to PI- or TNF-α-mediated apoptosis in lung cancer cells (Kim et al., 2000; Lee et al., 2013). This is the first study implicating Nrf2 and macroautophagy in the upstream mechanism leading to PI-induced IκBα degradation and subsequent NF-κB activation in lung cancer. Macroautophagy is a major autophagic process in which dysfunctional proteins are sequestered by cytosolic double-membrane vesicles for degradation (Cuervo, 2004). In contrast, chaperone-mediated autophagy is a more selective process that does not require such vesicular traffic; this process requires recognition of a peptide motif and binding to Lamp2a receptor (Majeski and Dice, 2004). 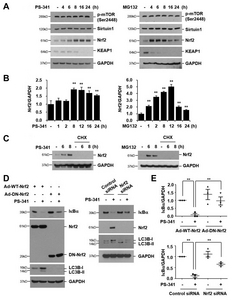 With PI-induced up-regulation of LC3B but not Lamp2a, as well as knockdown of LC3B which reduces PI-induced IκBα degradation, our results indicate that macroautophagy, not chaperone-mediated autophagy, is a key mechanism of resistance to PI-induced apoptosis in lung cancer. Although treatment with PI may slightly increase the protein levels of LC3B because of decreased proteasome-associated LC3B degradation (Gao et al., 2010), we showed that PI elevated LC3B mRNA levels. Nrf2 is known to have dual effects on cell death, preventing tumor occurrence in normal cells and playing a cytoprotective role in cancer cells (Hou et al., 2015; Lim et al., 2013; van der Wijst et al., 2015). The main mechanism of this resistance involves dissociation of Nrf2 from KEAP1, which enables Nrf2 to bind antioxidant responsive elements to promote the transcription of genes encoding antioxidant enzymes, leading to chemoresistance (Kobayashi et al., 2006; Leinonen et al., 2014). This is in accordance with the findings of previous studies of PI-mediated Nrf2-dependent upregulation of antioxidant enzymes (Dreger et al., 2009). In this study, we demonstrated PI-mediated, Nrf2-dependent activation of macroautophagy leading to subsequent IκBα degradation and determined two mechanisms by which PI up-regulates Nrf2: de novo protein synthesis and KEAP1 degradation. Clinically, high Nrf2 expression in tumor specimens is correlated with poor response rate of platinum-based chemotherapy and is an independent prognostic factor for survival in advanced NSCLC patients (Yang et al., 2011). Based on our findings, targeting Nrf2 or macroautophagy may improve the result of PI therapy in lung cancer. As suggested by our data showing that knock-down of Nrf2 enhanced PI-induced apoptosis, inhibiting Nrf2 is a promising approach. Autophagy blockade may also be a potential effective strategy for overcoming tumor resistance in chemotherapy and relevant data has been published in colon, hepatocellular, pancreatic cancer, and osteosarcoma (Ding et al., 2011; Li et al., 2010; Mujumdar et al., 2010; Wu et al., 2014). Recently, a study by Moriya et al reported improved chemotherapy outcomes following treatment with macrolide antibiotic, an autophagy flux inhibitor, in combination with bortezomib in multiple myeloma (Moriya et al., 2013). By simultaneously targeting the ubiquitin-proteasome system and autophagy-lysosome system, we may expect better outcomes in lung cancer as in other cancers (Ryter and Choi, 2015). In conclusion, our data show that PI-induced Nrf2 activation enhances macroautophagy, leading to IκBα degradation and subsequent NF-κB activation in NCI-H157 and A549 cells. Targeting these specific anti-apoptotic mechanisms may represent a novel strategy for overcoming the resistance to PI-induced apoptosis in lung cancer. Fig. 1. (A) NCI-H157 and A549 cells were treated with PS-341 (50 nM) or MG132 (20 μM) for the indicated times. Total cellular extracts were subjected to Western blot analysis for IκBα and GAPDH. (B) NCI-H157 cells were treated with PS-341 or MG132 for the indicated times. Nuclear proteins were extracted and subjected to Western blot analysis for p65 and Lamin A/C. TNF-α (10 ng/mL, 60 min) was used as a positive control. (C) Both cell lines were stimulated with PS-341 or MG132 for 0, 6, 8, 12, or 24 h. Total RNA was isolated and quantitative real-time PCR for COX-2 and GAPDH was performed. Data represent the mean ± SD of triplicate experiments. **P < 0.05 (D) NCI-H157 cells were treated with PS-341 or MG132 for the indicated times. Total cellular extracts were subjected to Western blot analysis for COX-2, cIAP2, and GAPDH. (E) NCI-H157 cells were pretreated with DHMEQ (10 or 20 μg/mL) for 2 h and then stimulated with PS-341 for 6 or 24 h. Nuclear proteins (6 h) and whole cell proteins (24 h) were isolated and subjected to Western blot analysis for p65, Lamin A/C, COX-2, and GAPDH. (F) NCI-H157 cells were transiently transfected with control siRNAs or p65 siRNAs. Forty-eight hours after transfection, the cells were stimulated with PS-341 for 24 h. Total cellular extracts were subjected to Western blot analysis for COX-2, p65, and GAPDH. Results are representative of three distinct experiments. Fig. 2. (A) NCI-H157 cells were treated with PS-341 (50 nM) or MG132 (20 μM) for the indicated times. Total cellular extracts were subjected to Western blot analysis for Lamp2a, Lamp2, LC3B, and GAPDH. (B) Cells were stimulated with PS-341 (50 nM) for the indicated times. Total RNA was isolated and quantitative real-time PCR for LC3B and GAPDH was performed. Data represent the mean ± SD of triplicate experiments. **P < 0.05 (C) NCI-H157 cells were pretreated with 3-methyladenine (3-MA, 5 and 10 mM) for 1 h and then stimulated with PS-341 or MG132 in the presence or absence of 3-MA for 6 h. Total cellular extracts were subjected to Western blot analysis for IκBα and GAPDH. Results are representative of three independent experiments. Fig. 3. (A, B) NCI-H157 cells were transiently transfected with control shRNAs, Lamp2 shRNAs, control siRNAs, or LC3B siRNAs. Forty-eight hours after transfection, the cells were treated with PS-341 (50 nM) or MG132 (20 μM) for 8 h. Total cellular extracts were subjected to Western blot analysis for IκBα, Lamp2a, Lamp2, LC3B, and GAPDH. Results are representative of three independent experiments. Aghajanian, C., Soignet, S., Dizon, D.S., Pien, C.S., Adams, J., Elliott,P.J., Sabbatini, P., Miller, V., Hensley, M.L., Pezzulli, S., et al. (2002).A phase I trial of the novel proteasome inhibitor PS341 in advancedsolid tumor malignancies. Clin. Cancer Res. 8, 2505-2511. Besse, B., Planchard, D., Veillard, A.S., Taillade, L., Khayat, D.,Ducourtieux, M., Pignon, J.P., Lumbroso, J., Lafontaine, C., Mathiot,C., et al. (2012). Phase 2 study of frontline bortezomib in patientswith advanced non-small cell lung cancer. Lung Cancer 76, 78-83. Coux, O., Tanaka, K., and Goldberg, A.L. (1996). Structure andfunctions of the 20S and 26S proteasomes. Annu. Rev. Biochem. 65,801-847. Cuervo, A.M. (2004). Autophagy: many paths to the same end. Mol.Cell. Biochem. 263, 55-72. Ding, Z.B., Hui, B., Shi, Y.H., Zhou, J., Peng, Y.F., Gu, C.Y., Yang, H.,Shi, G.M., Ke, A.W., Wang, X.Y., et al. (2011). Autophagy activationin hepatocellular carcinoma contributes to the tolerance of oxaliplatinvia reactive oxygen species modulation. Clin. Cancer Res. 17, 6229-6238. Dreger, H., Westphal, K., Weller, A., Baumann, G., Stangl, V.,Meiners, S., and Stangl, K. (2009). Nrf2-dependent upregulation ofantioxidative enzymes: a novel pathway for proteasome inhibitormediatedcardioprotection. Cardiovasc. Res. 83, 354-361. Esclatine, A., Chaumorcel, M., and Codogno, P. (2009).Macroautophagy signaling and regulation. Curr. Top. Microbiol.Immunol. 335, 33-70. Fanucchi, M.P., Fossella, F.V., Belt, R., Natale, R., Fidias, P., Carbone,D.P., Govindan, R., Raez, L.E., Robert, F., Ribeiro, M., et al. (2006).Randomized phase II study of bortezomib alone and bortezomib incombination with docetaxel in previously treated advanced nonsmall-cell lung cancer. J. Clin. Oncol. 24, 5025-5033. Gao, Z., Gammoh, N., Wong, P.M., Erdjument-Bromage, H., Tempst,P., and Jiang, X. (2010). Processing of autophagic protein LC3 by the20S proteasome. Autophagy 6, 126-137. Goldberg, A.L., Stein, R., and Adams, J. (1995). New insights intoproteasome function: from archaebacteria to drug development.Chem. Biol. 2, 503-508. Hou, X., Bai, X., Gou, X., Zeng, H., Xia, C., Zhuang, W., Chen, X.,Zhao, Z., Huang, M., Jin, J. (2015). 3',4',5',5,7-pentamethoxyflavonesensitizes Cisplatin-resistant A549 cells to Cisplatin by inhibition ofNrf2 pathway. Mol. Cells 38, 396-401. Kim, J.Y., Lee, S., Hwangbo, B., Lee, C.T., Kim, Y.W., Han, S.K., Shim,Y.S., and Yoo, C.G. (2000). NF-kappaB activation is related to theresistance of lung cancer cells to TNF-alpha-induced apoptosis.Biochem. Biophys. Res. Commun. 273, 140-146. Kobayashi, A., Kang, M.I., Watai, Y., Tong, K.I., Shibata, T., Uchida, K.,and Yamamoto, M. (2006). Oxidative and electrophilic stressesactivate Nrf2 through inhibition of ubiquitination activity of Keap1.Mol. Cell Biol. 26, 221-229. Lee, K.H., Jeong, J., and Yoo, C.G. (2013). Long-term incubationwith proteasome inhibitors (PIs) induces IkappaBalpha degradationvia the lysosomal pathway in an IkappaB kinase (IKK)-dependent andIKK-independent manner. J. Biol. Chem. 288, 32777-32786. Leinonen, H.M., Kansanen, E., Polonen, P., Heinaniemi, M., andLevonen, A.L. (2014). Role of the Keap1-Nrf2 pathway in cancer.Adv. Cancer Res. 122, 281-320. Li, J., Hou, N., Faried, A., Tsutsumi, S., and Kuwano, H. (2010).Inhibition of autophagy augments 5-fluorouracil chemotherapy inhuman colon cancer in vitro and in vivo model. Eur. J. Cancer 46,1900-1909. Lim, J., Lee, S.H., Cho, S., Lee, I.S., Kang, B.Y., and Choi, H.J. 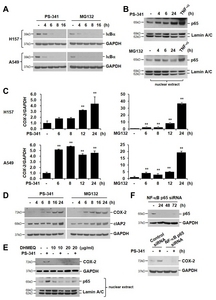 (2013).4-methoxychalcone enhances cisplatin-induced oxidative stress andcytotoxicity by inhibiting the Nrf2/ARE-mediated defense mechanismin A549 lung cancer cells. Mol. Cells 36, 340-346. Ling, Y.H., Liebes, L., Zou, Y., and Perez-Soler, R. (2003). Reactiveoxygen species generation and mitochondrial dysfunction in theapoptotic response to Bortezomib, a novel proteasome inhibitor, inhuman H460 non-small cell lung cancer cells. J. Biol. Chem. 278,33714-33723. Majeski A.E., and Dice, J.F. (2004). Mechanisms of chaperonemediatedautophagy. Int. J. Biochem. Cell Biol. 36, 2435-2444. Maki, C.G., Huibregtse, J.M., and Howley, P.M. (1996). In vivoubiquitination and proteasome-mediated degradation of p53(1).Cancer Res. 56, 2649-2654. Mandrekar, S.J., Schild, S.E., Hillman, S.L., Allen, K.L., Marks, R.S.,Mailliard, J.A., Krook, J.E., Maksymiuk, A.W., Chansky, K., Kelly, K., etal. (2006). A prognostic model for advanced stage nonsmall cell lungcancer. Pooled analysis of North Central Cancer Treatment Grouptrials. Cancer 107, 781-792. Masdehors, P., Omura, S., Merle-Béral, H., Mentz, F., Cosset, J.M.,Dumont, J., Magdelénat, H., and Delic, J. (1999). Increased sensitivityof CLL-derived lymphocytes to apoptotic death activation by theproteasome-specific inhibitor lactacystin. Br. J. Haematol. 105, 752-757. Moriya, S., Che, X.F., Komatsu, S., Abe, A., Kawaguchi, T., Gotoh, A.,Inazu, M., Tomoda, A., and Miyazawa, K. (2013). Macrolideantibiotics block autophagy flux and sensitize to bortezomib viaendoplasmic reticulum stress-mediated CHOP induction in myelomacells. Int. J. Oncol. 42, 1541-1550. Mujumdar, N., Mackenzie, T.N., Dudeja, V., Chugh, R., Antonoff,M.B., Borja-Cacho, D., Sangwan, V., Dawra, R., Vickers, S.M., andSaluja, A.K. (2010). Triptolide induces cell death in pancreatic cancercells by apoptotic and autophagic pathways. Gastroenterology 139,598-608. Pagano, M., Tam, S.W., Theodoras, A.M., Beer-Romero, P., Del Sal,G., Chau, V., Yew, P.R., Draetta, G.F., and Rolfe, M. (1995). Role ofthe ubiquitin-proteasome pathway in regulating abundance of thecyclin-dependent kinase inhibitor p27. Science 269, 682-685. Palombella, V.J., Rando, O.J., Goldberg, A.L., and Maniatis T. (1994).The ubiquitin-proteasome pathway is required for processing the NFkappaB1 precursor protein and the activation of NF-kappa B. Cell 78,773-785. Richardson, P.G., Barlogie, B., Berenson, J., Singhal, S., Jagannath, S.,Irwin, D., Rajkumar, S.V., Srkalovic, G., Alsina, M., Alexanian, R., et al.(2003). A phase 2 study of bortezomib in relapsed, refractorymyeloma. N. Engl. J. Med. 348, 2609-2617. Ryter, S.W., and Choi, A.M. (2015). Autophagy in lung diseasepathogenesis and therapeutics. Redox. Biol. 4, 215-225. Soligo, D., Servida, F., Delia, D., Fontanella, E., Lamorte, G., Caneva,L., Fumiatti, R., and Lambertenghi Deliliers, G. (2001). Theapoptogenic response of human myeloid leukaemia cell lines and ofnormal and malignant haematopoietic progenitor cells to theproteasome inhibitor PSI. Br. J. Haematol. 113, 126-135.
van der Wijst, M.G., Huisman, C., Mposhi, A., Roelfes, G., and Rots,M.G. (2015). 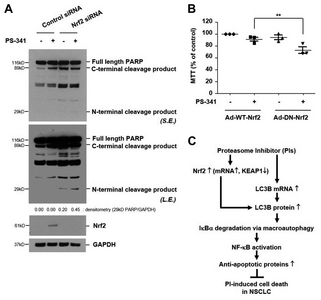 Targeting Nrf2 in healthy and malignant ovarianepithelial cells: Protection versus promotion. Mol. Oncol. 9, 1259-1273. Wu, W., Li, W., Zhou, Y., and Zhang, C. (2014). Inhibition of beclin1affects the chemotherapeutic sensitivity of osteosarcoma. Int. J. Clin.Exp. Pathol. 7, 7114-7122. Yang, H., Wang, W., Zhang, Y., Zhao, J., Lin, E., Gao, J., and He, J.(2011). The role of NF-E2-related factor 2 in predictingchemoresistance and prognosis in advanced non-small-cell lungcancer. Clin. Lung Cancer 12, 166-171. Yang, Y., Ikezoe, T., Saito, T., Kobayashi, M., Koeffler, H.P., andTaguchi, H. (2004). Proteasome inhibitor PS-341 induces growtharrest and apoptosis of non-small cell lung cancer cells via the JNK/c-Jun/AP-1 signaling. Cancer Sci. 95, 176-180. Zhou, Z.W., Li, X.X., He, Z.X., Pan, S.T., Yang, Y., Zhang, X., Chow, K.,Yang, T., Qiu, J.X., Zhou, Q., et al. (2015). Induction of apoptosis andautophagy via sirtuin1- and PI3K/Akt/mTOR-mediated pathways byplumbagin in human prostate cancer cells. Drug Des. Devel. Ther. 9,1511-1554. Zhu, L., Barret, E.C., Xu, Y., Liu, Z., Manoharan, A., and Chen, Y.(2013). Regulation of Cigarette Smoke(CS)-Induced Autophagy byNrf2. PLoS One 8, e55695.